The Antarctic Flight Line Maps or Flight Indexes are a collection of 1:250,000 scale topographic maps over Antarctica from the U.S. Antarctic Resource Center (USARC). The Antarctic topographic maps have original hand-drawn flight lines for aerial photographic missions. The collection includes over 300 maps and charts that encompass approximately 6,000 flight lines that have been flown over Antarctica by the U.S. Navy since 1946. Flight line maps in digital format allow users to identify flight and frame numbers over their area of interest to facilitate the search for single frame images. The Antarctic maps and charts were produced by the United States and member nations of the Scientific Committee on Antarctic Research (SCAR). The majority of the maps are USGS Antarctica 1:250,000 Reconnaissance Series topographic maps compiled from U.S. Navy aerial photographs. These maps were prepared, edited, and published by the USGS in cooperation with the National Science Foundation. The collection of maps covers 93 regions across Antarctica with multiple versions for areas that have extensive aerial coverage. The Antarctic Flight Line Maps feature hand-drawn flight lines along with the frame numbers of aerial photographs taken during the flight. The flight lines are labeled with TMA numbers, which is a reference to the trimetrogon aerial (TMA) photography acquired by the U.S. Navy for use in topographic mapping. TMA photography is a system of cameras positioned to take left oblique, vertical, and right oblique images simultaneously. The images are taken along a single flight line with the oblique cameras pointed at a depression angle of 30°. Each of the three cameras has an angular field of view of 60°, which provides 180° horizon to horizon coverage when the images are placed side-by-side. Not all flights were equipped with oblique cameras, and equipment malfunctions limited the availability of complete sets of photography. Flight lines continue to be cataloged by TMA number even though missions flown after January 1975 acquired images with a single vertical camera. The TMA flight number and frame number can be used as additional criteria in EarthExplorer to facilitate the search for photographic images in the Antarctic Single Frame Records collection. Since the flight line information is approximate, images should be previewed online to determine whether the area of interest is covered. Single frame aerial photographs can also be viewed at the Antarctic Resource Center in Reston, VA. The Antarctic Flight Line Maps and a full set of contact prints for each flight line are available as a library reference for on-site visitors. 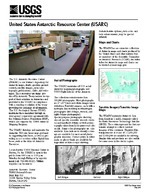 Antarctic Flight Line Maps are available in digital format through EarthExplorer and the USARC. The files are stored in JPEG format. Coverage Maps indicating the availability of Antarctic Flight Line Maps are available for download. *Note: The information on these links is being retained for technical and historical reference. These sites may not be under active maintenance and may include outdated information. EarthExplorer can be used to search, preview, and download Antarctic Flight Line Maps. The collection is located under the Aerial Imagery category. The USARC maintains the Antarctic Flight Line Maps and provides access to the collection on the Aerial Photo Indexes Menu. An alphabetical list of map names based on geographic features can be used to search, preview, and save the Antarctic Flight Line Maps.